The Muscat grape is one of the oldest grape varieties known to the wine world. Instead of being just one grape, Muscat encompasses a family of grapes, found in a range of hues – from white to brown to near black. The two best-known clones are Muscat Blanc a Petits Grains (Muscat blanc for short) and Muscat of Alexandria. The Muscat blanc grape is the oldest variety and creates the most concentrated grape flavors. Small in size, Muscat blanc is not always white and it can produce both dry and sweet wines. Muscat of Alexandria is larger and often darker than the Muscat Blanc, and creates wines of intense sweetness. Muscat Blanc is the Moscato used in Italy for Moscato d’Asti and Spumante, both light and fizzy wines. It also creates the Muscat d’Alsace of France, which is often made in the dry style. Muscat Blanc can also be found in the deliciously sweet wines of Beaumes-de-Venise in the south of France. The Muscat of Alexandria is responsible for the “stickies” of Australia, as well as the Muscats of Portugal and South Africa. 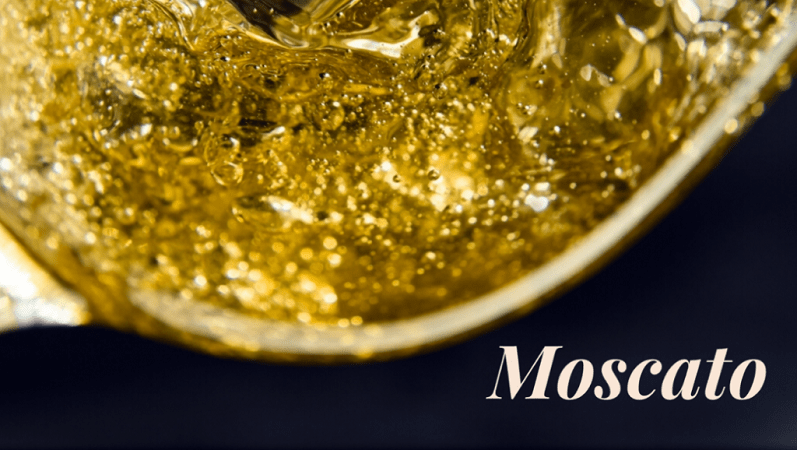 California also has a hold on producing sweet dessert wines from Muscat.